“Rethinking the Niagara Frontier” was a bi-national effort to stimulate conversation, re-imagination, and collaboration toward making the most of opportunities at hand for the future of this region that centers on the Niagara River. The potential for generating greater prosperity and improving the quality of life in the region is great – with special opportunities in the growth of heritage and cultural tourism, the improvement of the built and natural environment, creative redevelopment of former industrial lands, investments in trade and transportation, and development of knowledge based industries. Dozens of organizations – in government, business, education, environment, philanthropy, and community advocacy – joined with the original instigators — the Waterfront Regeneration Trust of Ontario, and the Urban Design Project of the University of Buffalo — to explore the possibilities. Initial meetings in the Winter of 1999 were followed by a major bi-national forum in March 2000. A November 2000 conference focused on the presentation of both concrete action projects and a more detailed vision for the region. 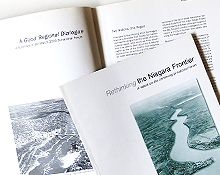 “Rethinking the Niagara Frontier” sought to stimulate action and promote collaboration among autonomous agencies and across national and sectoral boundaries through communication, critique and celebration.